Even if I am very much into crocheting, I am not that familiar with the parts of a hook. 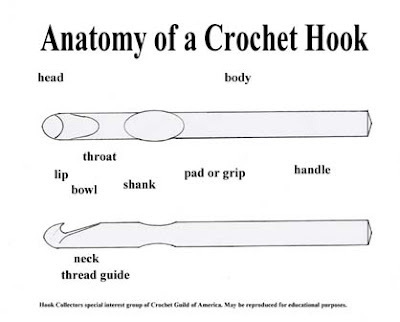 So let's look at the anatomy of a crochet hook. Aside from that, hooks have different sizes too. 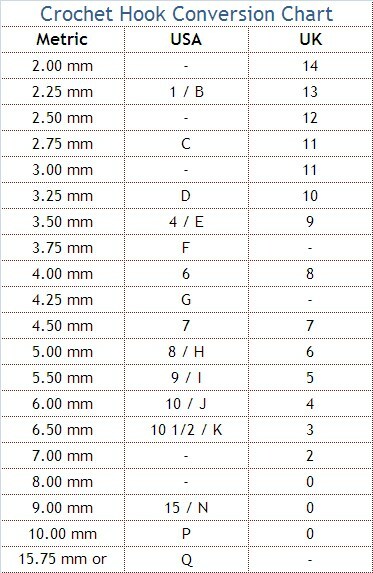 Just like the crochet pattern terms, there's also crochet hook conversion chart. I frequently use the size 5 and 6 hooks. You need to determine what size of hook to use in a specific type of yarn so your project will appear good and sturdy. There are so many things to learn about the basics of crocheting. Hook is just one and there are types of hook as well. Next time we will discuss about the types and kind of hooks available. Thanks for the guidelines, mommy!